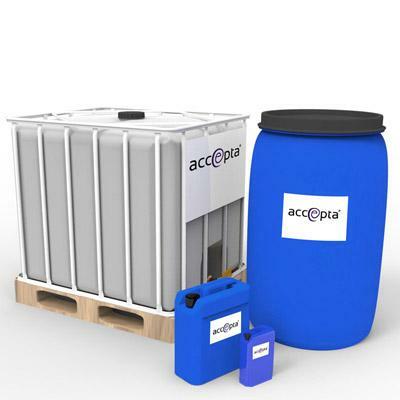 Accepta 8708 is an innovative activator solution used to generate high purity chlorine dioxide (ClO2) using Accepta’s high-performance Activ-Ox chlorine dioxide generating system. Accepta 8708 is used in conjunction with either Accepta 8710 or Accepta 8720 and the Activ-Ox Simplicity generator. 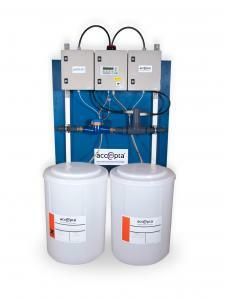 Accepta 8708 is a specially formulated dilute acid solution approved by the UK Drinking Water Inspectorate. It is used in conjunction with Accepta 8710 or Accepta 8720 to release the ‘active oxygen’ disinfecting power of chlorine dioxide. Accepta 8708 is much safer than other strong acid activators used with so-called ‘stabilised chlorine dioxide’ solutions and is classified as non-hazardous according to the CHIP Regulations. Accepta 8708 should be dosed at the same rate as Accepta 8710/8720 and used strictly in accordance with the recommendations of your Accepta technical consultant. Accepta 8708 and Accepta 8710/8720 products should never be mixed neat and where the continuous application of chlorine dioxide is required an Activ-Ox chlorine dioxide generating system should be used. For further technical assistance concerning dosage rates for Accepta 8708 please contact Accepta technical support.